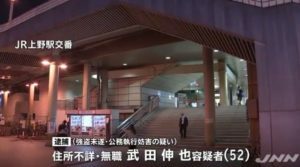 TOKYO (TR) – Tokyo Metropolitan Police have arrested two of four persons who used tear gas in the attempted robbery of 40 million yen in cash in Taito Ward on Monday, reports TV Asahi (Nov. 12). At around 1:30 p.m., the four male perpetrators, all wearing breathing masks, sprayed the gas into the faces of two employees of a precious metals shop who were in possession of a bag containing the cash on a street. After one of the employees let out a loud yell, all four perpetrators fled empty-handed. Officers later apprehended two of them inside a black van about two kilometers from the crime scene. 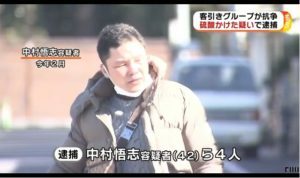 “Why [is there] a camera [pointed at me]?” one of the perpetrators said in front of a TV Asahi camera. Just before the incident, the two employees, including the president of the company operating the shop, withdrew the cash from a nearby bank, according to police. One of the perpetrators who fled carried out his escape via taxi. 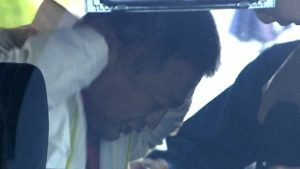 During the ride, he spoke a mix of English and Korean on the telephone, the driver told police. Police are questioning two perpetrators in custody and seeking the whereabouts of the other pair on suspicion of attempted robbery.